AJ Styles will defend the WWE World Championship against Dean Ambrose in a TLC Match on Sunday night. The SmackDown brand will bring some TLC to the American Airlines Center in Dallas. No, I’m not talking about tender loving care; I’m talking about tables, ladders and chairs. The December pay-per-view has become a staple in WWE and the men and women from SmackDown get to reap the benefits of one of the more extreme pay-per-views of the year. 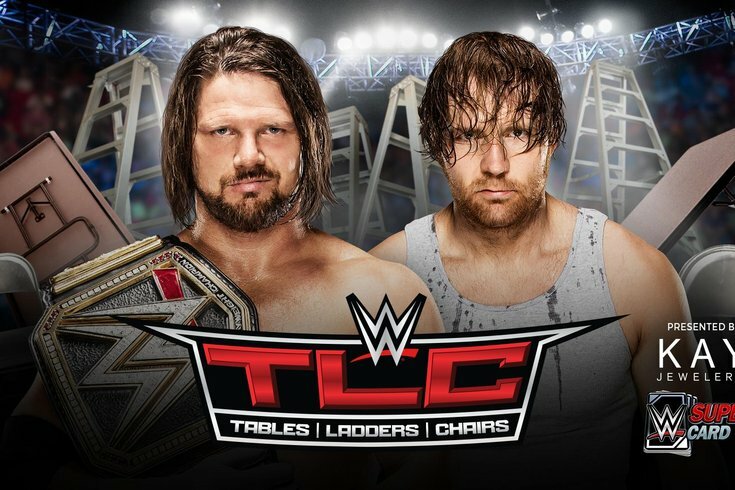 This year, the WWE World Championship will be defended in a TLC match, where tables, ladders and chairs are not only legal, but encouraged. We’ll also see separate matches featuring a table, a ladder and steel chairs. Now here’s a feud that may have lasted way too long. I like both Corbin and Kalisto, but what good is Kalisto without the Cruiserweight Division? He’s been lost on SmackDown and this feud isn’t exactly lighting the world on fire. So what can WWE do to make this feud appealing to the fans short of completely scrapping it? Introduce chairs, of course! This match allows both participants to use a steel chair, or two, or eight, to their own delight as they try to incapacitate one another. On paper, this seems like it’s right down Corbin’s alley, but with how WWE’s been booking Kalisto, I’m not so sure he doesn’t squeak out a win here to further the feud. Eventually, Corbin has to come out of this feud as the winner, and it should happen at TLC. I just don’t think it will. I can’t remember the last time we had a women’s No Disqualification match that wasn’t for any women’s or diva’s title. That’s why I think SmackDown’s been the better brand in terms of how they utilize the women compared to Raw. Raw’s had Sasha Banks and Charlotte headline Raw and a pay-per-view and the blue brand is still boasting the better division because the storytelling has been better for each individual wrestler. The Bella-Carmella feud hasn’t been great, but it’s been enough to get Carmella over with the audience and make her a legit character on the show. The audience buys her as a heel and she’ll probably be next in line to face the SmackDown Women’s Champion, whoever it is after Sunday night. Which is why a win over Bella could propel her to that. For the second time in the last four months, American Alpha has been taken out of a Tag Team Title opportunity. This past Tuesday on SmackDown, Bray Wyatt and Randy Orton defeated Jason Jordan and Chad Gable to gain No. 1 contendership to Heath Slater and Rhyno’s SmackDown Tag Team Championships. While I’m disappointed to not see American Alpha have a chance at winning the titles, I’m hoping this sets up something down the road where they’ll eventually beat Wyatt and Orton for them. Yes, that means I expect Wyatt and Orton to win the titles on Sunday night. Slater and Rhyno have had a good run, but Wyatt and Orton have actually been a pretty good team since Orton joined the Dark Side. I, along with many others, think it’ll lead to Orton turning on Wyatt down the road, and a match between the two will have a lot more meaning. But, for now, give them a run with the titles and make them important. They’ll be more important on Wyatt and Orton than on Slater and Rhyno. This is being billed as the last match between Ziggler and The Miz ever. Ever. That leaves me with the question, where does Ziggler go from here? He almost needs to win on Sunday night in order to have a significant future in WWE. The Miz is a great heel character and it can likely work with any other wrestler on the roster at the moment. If Ziggler doesn’t win, I don’t see anywhere for him to fit on the card. Maybe a new superstar debuts and costs him the match, and he engages in a feud with someone [maybe from NXT] to help elevate them like WWE tried to do with him and Ambrose right after the brand extension. While I could see something like that playing out, I think The Miz will ultimately retain. Of all the feuds on both Raw and SmackDown lately, I like this one the most. Bliss has really shown she belongs on the main roster given her promos and in-ring work. She’s in one of the biggest spots on the show and I think she’ll knock it out of the park. Bliss just won’t win the match. It’s not time to take the title off Lynch just for the sake of doing it. As good as the women’s division on SmackDown has been, there’s nobody that really should get a run with the title other than Lynch. The brand needs to create the next big star and that’s still happening right now. Could it be Bliss in the future? Sure. Carmella? Maybe. Naomi? I think we’ll see a Naomi title run in 2017. But on Sunday night, I expect Lynch to retain in a very good match. All he did we help James Ellsworth scored a third straight victory over the champion, which now has the unfortunate circumstance of possibly overshadowing the main event Sunday night. People will be wondering where Ellsworth is if he’s not involved at all. However, I fully expect him to be involved at some point during the match; maybe even on commentary. Even after Styles destroyed him on Tuesday night. This is a glorified ladder match, with the additions of tables and chairs, so I expect this to be a very good match. Styles and Ambrose have had good chemistry the last few months, but it’s time to see this feud end. Styles should remain champion heading into WrestleMania, and by that time hopefully SmackDown will have a big top babyface to dethrone him. Styles has had a hell of a ride this year and has been a really good heel. He’s the MVP of SmackDown since even before the brand extension. Look for Ambrose to take a big bump, perhaps by way of an Ellsworth heel turn, to allow Styles to retain. Though I’m not thrilled with a possible Ellsworth heel turn (it makes sense in the long run, it’s just a matter of when they do it) at the moment, it wouldn’t be surprising if it happens. WWE is sort of backed into a corner now where the audience is wondering what Ellsworth will do next. I just hope it doesn’t overshadow the match. This will be the third SmackDown brand pay-per-view since the second brand extension back in July. I think each one has ranged from good to very good, so I have some pretty high expectations for this one. The main event should deliver and the undercard looks promising. SmackDown has been the better brand since the extension began back in July, even with the limited talent they have compared to Raw, which is a three-hour show. Make sure you check back here Monday morning for your TLC recap with thoughts and analysis.